A Houston federal grand jury has formally indicted a local state district judge on bribery charges. On Wednesday, jurors found there to be enough evidence and returned a six-count indictment alleging that Rodolfo “Rudy” Delgado, judge of the 93rd state District Court, took bribes on at least three different occasions and did so while using a phone, the indictment states. The three counts of violating the travel act are based on the allegation that Delgado used a phone to complete the alleged deals with the attorney. 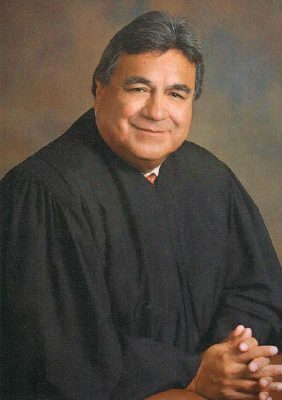 Delgado who has served as state judge since 2004, was most recently campaigning for a seat on the 13th Court of Appeals. Late Thursday evening the State Commission on Judicial Conduct suspended Delgado without pay until further notice from the commission. More than 13 years ago the commission suspended Delgado after he was arrested in connection with driving while intoxicated. His suspension was lifted less than four months later after the charges were dismissed. Last week Delgado was granted a motion to have his two local attorneys replaced with San Antonio attorney Michael W. McCrum after government prosecutors requested the court resolve what they believed was a conflict of interest stemming from Adolfo “Al” Alvarez’s representation of Delgado. The 64-year-old Edinburg resident, who has been free on a $100,000 bond since his intial appearance in McAllen federal court in early February, is expected to be arraigned March 9 in Houston before U.S. Magistrate Judge Christina A. Bryan, according to court notes.